Do Speed Limit laws Provide Enough Protection to Portland Drivers? In Portland, Hillsboro, and Gresham, drivers have maximum speed limit laws that they must obey. States set their own speed limit laws. However, prior to 1995, there was a federal law in place setting a national maximum speed. Initially, the national maximum speed was 55 MPH but then in 1987, the national maximum speed was raised to 65 MPH. In 1995, the National Maximum Speed Law was repealed and states pushed their speed limits even higher. A personal injury lawyer knows that when speed limits went up, fatal car accidents increased in Oregon and throughout the United States. 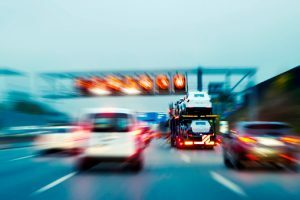 After the states allowed drivers to go faster following the repeal of the federal law, there was a 3.2 percent increase in fatal traffic crashes. In 10 years, there were an estimated 12,545 deaths that happened because of the faster speed limits. Are Speed Limits Enough to Keep People Safe? Speed limits clearly make a big difference in terms of the chances of motorists dying in a motor vehicle accident. Speed limits can also affect the safety of pedestrians. When a person is hit by a 23 MPH car, the victim of the crash has a 10 percent chance that the crash will cause fatal injuries. If that car speeds up just a little and a pedestrian is hit by a 32 MPH car, the crash victim only has a 25 percent chance of survival. Since speed limits can have a profound impact on whether people live or die, it would be a natural assumption to think that these speed limits are carefully set using complex formulas designed to save the most lives possible. This, of course, is not the way that they are set. The basic process for setting most speed limits dates back to a 1964 study. The process involves taking a look at how fast people go on the road that needs a limit. If a new road is being constructed, then the process involves looking at how fast people go on a similar road. When the speed of the cars on the road is determined, the speed limit is set at the 85th percentile, with 85 percent of cars going below that particular speed and 15 percent of vehicles going above that speed. Speed limits that are arrived at using this method are called rational speed limits. They are called this because they’re based on what drivers do and they are set this way based on the theory that drivers will only obey reasonable speed limits on the roads. One problem with this approach is that when drivers see a speed limit, they tend to think that this is the minimum safe speed they can go and they often travel faster than limits. This can mean that the road gets less safe because people feel more comfortable traveling faster than they normally would due to the confidence that the posted limit brings. FiveThirtyEight indicates that this is why speed limits are not enough to prevent people from dying in car crashes. Drivers need to be aware of how speed limits are established and be sure that they travel at a comfortable speed based on the road conditions. Portland accident victims should contact Zbinden & Curtis, Attorneys at Law, by calling 1-503-287-5000 or visiting http://www.zbinden-curtis.com.